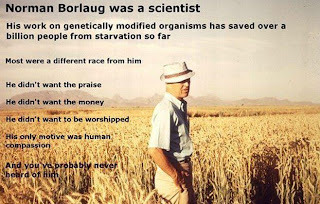 The Third Kingsland Irregulars: Everyone should know who Norman Borlaug is. So I shared this photo on the book of face this afternoon (yes, I to am horrified at having two posts in a row inspired by events from that den of ...).
" clearly well-intended, pushing the boundaries of the creaking-at-the-seams, soil-exhausting, monoculture methods of the past might not prove to be the best idea... "
Which is fair enough, he did push the boundaries of a creaking system. In doing so though, he gave us breathing time to sort out our looming population/supply problems and saved the lives of millions of people. The fact that the opportunity to solve these problems has been squandered is beside the point - he did what he was able to do at the time with the tools available in order to save lives. Something we should aspire to. So now we are left with a world that, if we are really really lucky/organised(ha! ), will have another 2 billion people in it. Having pushed the boundaries already, there's not a lot more we can wring out of the system. As we approach the limit of what we can do in agricultural terms, we are beginning to look towards sustainability. If growing more is to mean anything, we have to control population growth at the same time as improving our distribution systems and varying the crops we grow - the monoculture system has been pushed to the limit and is now beginning to fall over. 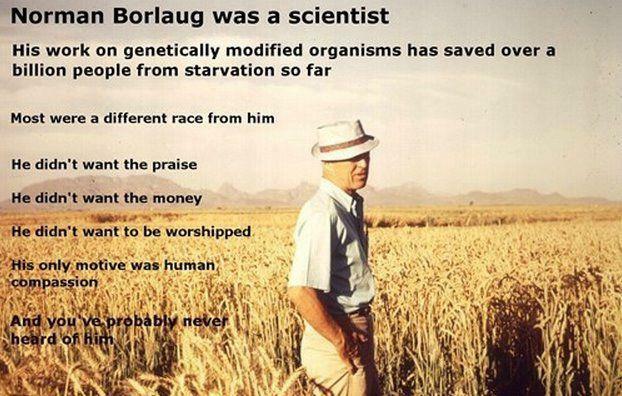 Whatever advantages we were able to wring out of it, people like Borlaug have already done it. PSA is destroying kiwifruit so easily becuase kiwifruit is a monoculture. Banana is another monoculture crop having difficulties along with citrus in Florida. Rein in Monsanto by all means, for destructive business practices, but throwing a tool like genetic engineering out of the toolbox is shortsighted. It's not a tool to be used in all circumstances just because we can, where appropriate though, I think it should be used. There are going to be hiccups along the way. Some bugs will evolve resistance. We'll find another way to fight them. It's what happened when we started using pesticides. It's what happened when we started farming. We are never going to have a perfect system of pest control, it's a running battle. Crops that use less pesticide/herbicide though, need to be sprayed less, the soil is disturbed less, which is better for growing bigger crops. Crops that fix their own nitrogen could reduce the need for rotational planting. GE is a tool. The choice we face is between a Malthusian solution or some sort of humane transition to a sustainable system of agriculture for a sustainable population level - and it's a choice yet to be made.